Wayne Kinsey’s long running Hammer magazine (1997-2009) was a serialised history of Hammer in 3 volumes (each 8 issues) featuring exclusive interviews and blood rare photographs. This was a year by year history of the company with detailed accounts of the films each year. 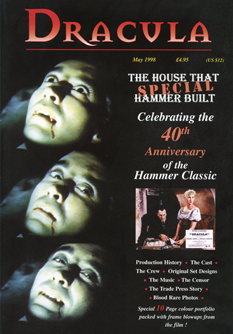 This was a chapter by chapter guide through the various departments at Hammer which was later expanded to form Hammer Films – the Unsung Heroes. These issues contain all the original full interviews with the Hammer team. This featured the popular A-Z of Hammer actors/actresses, listing biographies and filmographies of actors starring in more than one Hammer film and other noted stars that featured in one. Exclusive interviews with them and an ongoing detailed account of the work of Bernard Robinson and the sets he built at Bray, together with a host of other features. A special issue dedicated to Hammer’s first Dracula (1957). All you need to know about the Hammer classic!